Well the cone of silence has been lifted and the news has gone public: Macarons by Duncan are being offered for sale to the public once more! As I wrote last month, in my opinion Macarons by Duncan are easily the best macarons in Melbourne. Thanks to the macaron tower that Adriano Zumbo presented on a certain Channel 10 culinary reality TV show that ended last week, it seems that everybody and their dog is talking macarons at the moment (oh and speaking of A.Zum, reading 'Macarons or Macaroons? MasterChef judges should know better, says chef Adriano Zumbo' only made me love him MORE, if that's even possible). So where can you buy Macarons by Duncan? 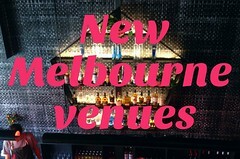 They can be found at the CBD cafe Liaison (which I have previously written about here), but only on certain days of the week - be sure to read Duncan's announcement so that you're fully informed about when they're available. When I heard they were there, I got a couple last week (pictured above): 'Beth' is orange and milk chocolate, and 'Darcy' is vanilla with cocoa nibs. Both are exquisite. Enjoy! UPDATE: Duncan has posted the following update on his blog. Please be nice, people! They really do look like lovely macarons - I must try them next time I make it down to Melbourne. But even better is that Duncan names his creations - that is just wonderful - love it! I've had a day in search of macarons in Melbourne. Yes, I admit Masterchef started this for me... it'd been years since I'd had a macaron and ever since I saw that macaron challenge I've had a craving. 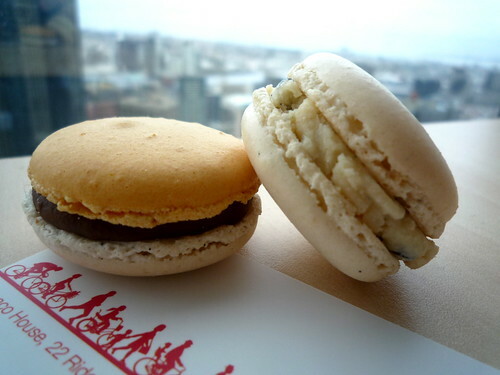 So with today free, I innocently typed "best macarons in Melbourne" into google and found my way here... and low n' behold, today was the day Liaison were selling Duncan's macarons (perfect timing eh?) - so I caught the train to Parliament, made my way down Little Collins and into Liaison by 11AM only to be told they had all sold out in 3 minutes! DAMMIT! ...and to add insult to injury, I was told that they had all been bought by only 3 customers! So unfair! Liaison should have a 4 macaron limit per person! Sooo ..er, does anyone here wanna confess to buying all the macarons?! After Liaison I made my way to Cafe Vue and had 4 macarons; chocolate, raspberry, pistachio and passion-fruit... and they're were very good, but I'm gonna try again Friday at Liaison... might consider camping out front. After seeing them on Masterchef (like so many of us did) I have got to try this place Liaison. The pictures looks so lovely. They make my Mouth Water.When i try them I'll let you know. I have not found good macarons in Adelaide (any advice is welcome) so I made my own. Nailed it on the first try. Claire, I love love love love your blog! You inspired my latest post on The Polkadot Pantry and I was thrilled to see you followed up again with another macaron post. 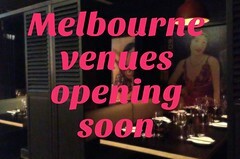 Always use your blog for inspiration when heading to Melbourne and looking for somewhere fab to eat. A Drop in the Bucket - try From Scratch Patisserie at the Adelaide Showground Farmers Markets - they're online too. I thought they were a great attempt at macarons - crispy outside and gooey middle. LOVE! Wow, those macarons look fantastic. I have seen so many sad, flat looking macarons of late (selling for ridiculous prices too!) but I will definitely hunt these out. Hi B.P. They're fabulous and yes, I love the names too. What would it take to get Duncan to name one of the macarons after ME, I wonder??!?!? I'm sorry you missed out Simon! I believe there may be a macarons per person limit now. Hi Anonymous, ooh I WOULD like to try monsieur truffe's take on macarons. Duly noted!